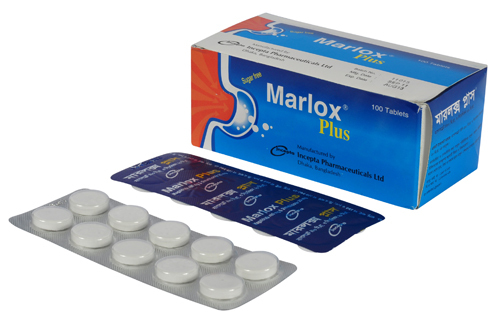 Marlox Plus Tablet: Each tablet contains Magaldrate BP 480 mg and Simethicone USP 20 mg.
Marlox Plus Suspension: Each 5ml contains Magaldrate BP 480 mg and Simethicone USP 20 mg.
Marlox Plus is a combination of magaldrate and simethicone. Magaldrate (magnesium aluminium compound i.e. Hydroxymagnesium Aluminate), which neutralizes gastric acid extraordinarily quickly without raising the pH above 5-6. It also decreases the activity of pepsin in gastric secretion. Besides this, simethicone, the another component of Marlox Plus, enables the gas buble to coalesce and give relief from flatulence. 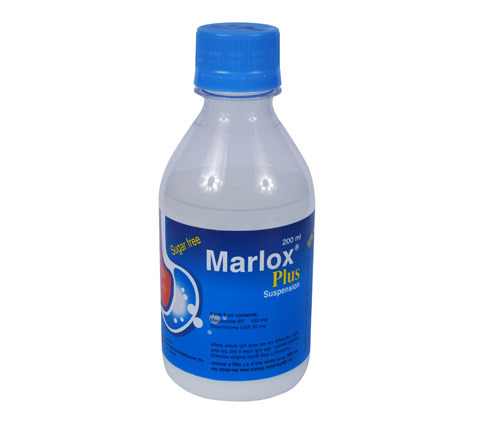 Marlox Plus is indicated to relieve symptoms of dyspepsia, heartburn, acid indigestion, sour stomach, gastroesophageal reflux and hiatal hernia. It is also prescribed in hyperacidity associated with peptic ulcers, gastritis and esophagitis. Magaldrate may be given to children if necessary. Also indicated for the relief of flatulence, abdominal distension and windy colic. Tablet: 1-3 Marlox Plus tablet, after meals and at bed time or as directed by the physician. Suspension: 2-4 teaspoonfuls after 20-60 minutes of meal and before sleep or on the basis of physician’s prescription. GI side-effects are uncommon. Occasionally, if excessive amount is consumed, diarrhea, constipation or regurgitation may occur. Care should be taken in decreased kidney function, hypophosphataemia and weak people. Pregnant women: Magaldrate may be used in pregnancy if indicated. However one should avoid excessive dosage. Lactating mother: Magaldrate may pass into breast milk but has not been reported to cause problem in nursing babies.